Freeman’s Journal, 21 May 1920. On May 15th, the munitions are unloaded back onto the dock side, and on the side of one case is a very familiar sticky-back, ‘Hands Off Russia!’ It is very small, but that day it was big enough to be read all over the world. …a member of the dockers’ section of the Dublin No.1 Branch came to see me late one evening. He told me there were two vessels coming to Dublin with munitions to be used in the war here. One of the boars had arrived and was ready to be started discharing first thing on the following morning. He said that he might be one of the casual dockers, hoping to be picked for this job. The work went on – making train wrecking tools, hand bombs, and everything that would be handy and useful when required. Several British naval vessels came to the dockyard for repairs – as our firm was on the Government list for such – and several raids were made on these vessels for arms when most of the crew were ashore. When news of this proposed radical action was brought to O’Brien’s desk, he informed the visiting docker that he would raise it with Thomas Foran, General President of the union. The following day, the men standing around waiting to begin work were told that the work was not to start. The munitions strike had begun. On hearing of the political action at the Dublin docks, the second ship was then diverted for Dun Laoghaire. Here, the military were on hand to unload its cargo, but when it arrived at Westland Row station, workers there refused to handle the goods. This, as Padraig Yeates notes in his masterful study of Dublin in the period,upped the temperature considerably. While the dockworkers were casual workers who could be reallocated elsewhere, the railwaymen were permanent employers and members of the separate National Union of Railwaymen. The Freeman’s Journal shows the goods which Dublin dockers refused to offload. A brave stand that began on the docks of Dublin spread nationwide, largely thanks to the militancy of railway workers. From arms in storage, the strike was widened to include the carrying of men holding arms representing Crown Forces. One Irish Volunteer, also employed at Mallow train station, recounted being dismissed from his job in his statement to the Bureau of Military History, noting that “when eventually 19 men had been dismissed for the same reason, the O/C Mallow decided to take the stationmaster prisoner and to detain him for a time.” The strike has real potential to create such tensions in work forces across the country. The munitions strike was an effective tactic, proven by the infuriated responses to it from the upper-echelons of the British military and political class. In Westminster, Hamar Greenwood thundered that “no government can allow railways subsidised out of the pockets of the taxpayers to refuse to carry police and soldiers.” Likewise, in his Annals of an Active Life, Sir Nevil Macready, Commander in Chief of Crown Forces, acknowledged the tremendous difficulty the munitions strike created for the movement of men across the island. Some £120,000 was subscribed to support men victimised for their participation in the strike, but in the absence of sympathetic strike action in Britain, and with increasingly vicious physical assaults on railwaymen, the Irish leadership felt increasingly vulnerable in the dispute, which eventually wound-down in December. In November, the Government began closing rail lines, including the Limerick to Waterford and Limerick to Tralee lines,as well as trains into Galway city, which certainly instigated a fear among the public that the Irish railway system could be shut down in its entirety. As both an industrial action and an example of mass civil disobedience, the munitions strike is a part of the story of revolutionary Ireland which is deserving of a place in this on-going Decade of Centenaries. Working class militancy across the island of Ireland, from the (largely Protestant and Unionist working class) Belfast Engineers Strike of 1919 to the Limerick Soviet, demonstrated the power of organised labour here clearly. In refusing to load or carry the weapons of war, both dockers and railwaymen demonstrated a unique form of opposition to the British occupation of Ireland. In February 2015, I published an article listing the remaining 14 or so ‘early house’ pubs in Dublin city centre along with some brief historical background about why these bars have special licenses allowing them to open at 7am. 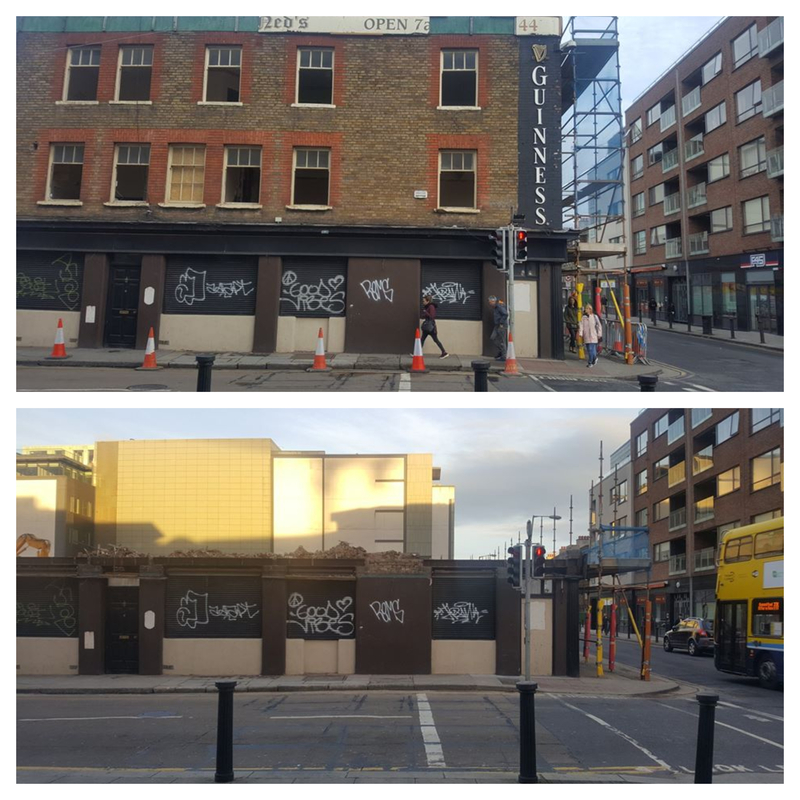 In the last four years, one pub has been demolished and two have closed down. A further three have been put on sale or sold so their futures are uncertain. The Dark Horse Inn on George’s Quay closed its doors in July 2016 and reopened as a Starbucks coffee shop the following month. I wrote a long piece about the history of the building here. Ned Scanlon’s on Townsend Street closed and and the pub was demolished in October 2018. We’ve also heard that The Capel Bar on Little Green Street, which featured in a 2016 Dublin Inquirer piece, has closed in recent months. So as far as I can assert, these are the remaining 10 ‘early house’ pubs in Dublin as of early 2019. 2. The Chancery Inn, Inns Quay (Mon-Fri 9am; Sat 7am). The pub (and five apartments) was on the market for €1.7 million in May 2018 so it’s unclear what the future may bring. 3. Delaney’s, North King Street (Mon-Sat 9am). This pub was up for sale in 2016 but no changes has affected it yet it seems. 5. The Metro, Parnell Street. 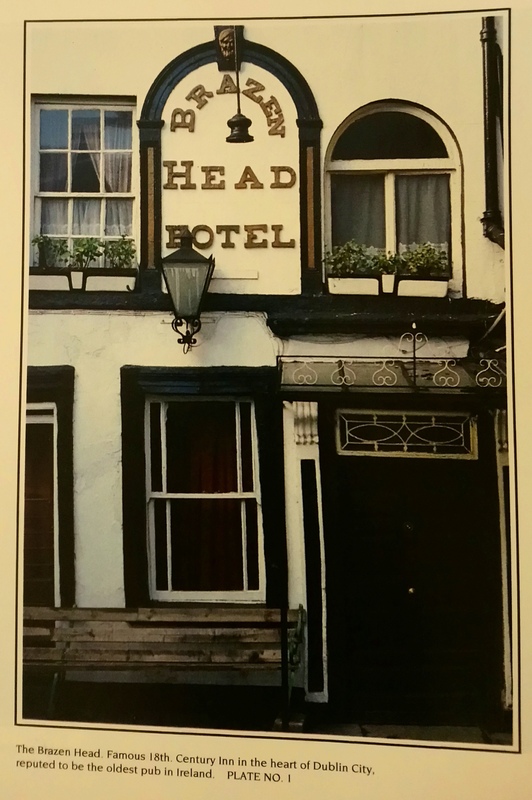 After sixty years in business, the current owners have retired and put up the pub for sale in October 2018. So time will tell whether the pub will continue to open early. My thanks to my friend Dorje for passing on a heap of old copies of In Dublin recently. An invaluable publication in the days before social media, it gave some sense of what was happening in the city. Dating from 1977 and 1978, these issues give good insight into culture in the city. Many of the places advertised within remain loved parts of the city today. Firstly, and most importantly, Grogans public house on South William Street. There are two advertisements from the gay rights movement, firstly Tel-A-Friend (which in time became the Gay Switchboard), and secondly the Irish Gay Rights Movement, with its phoenix logo rising from the ashes. 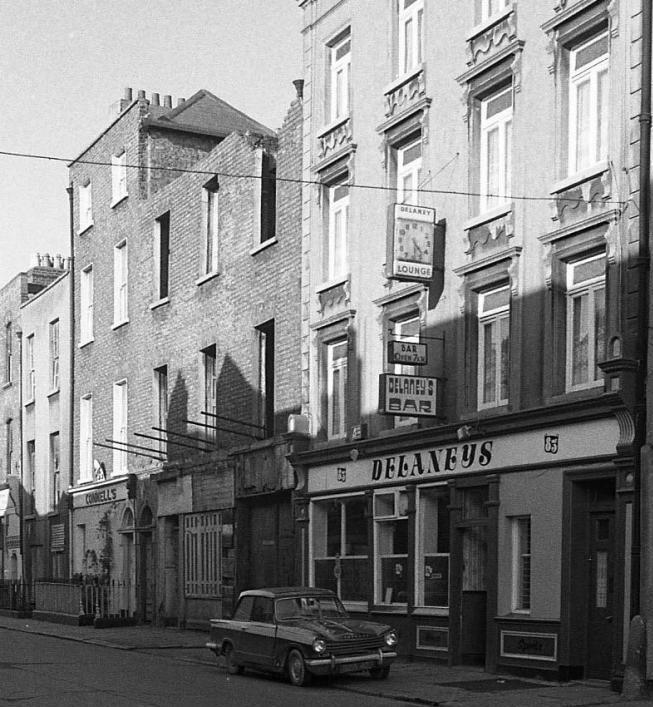 The movement was based at Temple Bar’s Hirschfeld Centre, which was also home to Dublin’s much-loved Flikkers disco. Playing Larkin is a pleasure and an honour. Some parts are just performance tasks, but Larkin was one of the finest specimens of humanity; a wonderful mind, great courage with the heart of a lion, unusual vision, and a voice like rolling thunder. -Jer O’Leary on playing the role of Larkin, Evening Press, January 1980. There are many difficult audiences in this town, but if you haven’t, you should try explaining the ins and outs of the 1913 Lockout to a room full of school children. Against the backdrop of the centenary of the great dispute, I had the pleasure of trying this. They listened, though how much of it registered has puzzled me since. Following a brief historic overview, the next speaker was Jer O’Leary. The veteran and much-loved Dublin actor shook the walls of the Ringsend school, bringing the words of Jim Larkin to life. I think the children by the end had some sense of the power of the story. Dubliner Jer O’Leary, the Bard of Drumcondra, lived many lives in one. As an actor, activist, artist and raconteur he was a frequent face on the streets of Dublin. His booming and distinctive voice could be heard across the street over any volume of Dublin traffic. He was, firmly and completely, a man of the Left. In 1967, a 22 year old Jer O’Leary joined the Republican movement, the beginning of a life-long involvement in republican and socialist politics that shaped everything he did. O’Leary in the Project in 1986 at an exhibition of his labour movement banners. More on that below. Football was a great love too. As the book The Lost Revolution rightly notes, “he delighted in reminding GAA devotees that the Dublin IRA’s commander in 1921, Oscar Traynor, had been a soccer player.” O’Leary may well have attended more FAI Cup Finals than Traynor himself, and was present in 1961 when Saint Patrick’s Athletic won the cup in Dalymount Park against his own beloved Drumcondra. Willie Peyton’s heroic goal that day is something I’ve heard of from many Pats fans that were in attendance, but nobody told the tale as well as Jer. Each time I heard the story from him it was as if Peyton was deeper and deeper into his own half. Eventually in the telling, he may as well have been in deepest suburban Cabra kicking a ball in the general direction of the stadium. Whatever the debate about where Peyton kicked from, he was certainly far from goal. When Drumcondra went to the wall, one of the great losses of Irish footballing history, O’Leary retained a grá for association football in Dublin. A great Celtic fan, like his late son Diarmuid who died in tragic circumstances on a trip to see the Hoops, he remained familiar with Dalymount Park as a supporter of Bohs. Still, like all true Drumcondra fans, he answered ‘Drums’ to the question of which Dublin team he supported. Those who kept faith with the sport are now spread across the football grounds of Dublin. A Bohemian FC flag produced by Jer O’Leary, bringing together two of his great passions. The play, a Marxist view of the French Revolution, coincided perfectly with O’Leary’s vision for modern day Ireland. But one fine night at the end of the performance, the actor decided that modern Ireland and revolutionary France should bridge the gap of time. He told the packed house in a completely unrehearsed speech that the alleged Sallins train robbers, who were then on trial, were completely innocent. For his ‘unprofessional conduct’ he had to be rescued from the wrath of the cast, whose efforts to hang him fro the highest point of the dressing room were guillotined by the back stage staff. There was something about Jer as Larkin that registered deeply with Dubliners, even if the Toxteth-born Scouser developed an accent more akin to Dublin’s north inner-city, the energy was a perfect replica. In 1993 he was centrally involved in the historical commemorations of the Lockout organised by the North Inner City Folkore Project, addressing a huge crowd from the window of Clery’s, and he would revive the role for further historic anniversaries. Countess Markievicz recalled hearing Larkin speak and feeling that she was in the presence of “some great primeval force rather than a man”. To try and be Larkin took a certain confidence, which Jer had in abundance. I picked up this book for $5 in the amazing Powell’s bookshop in Portland, Oregon during the summer. 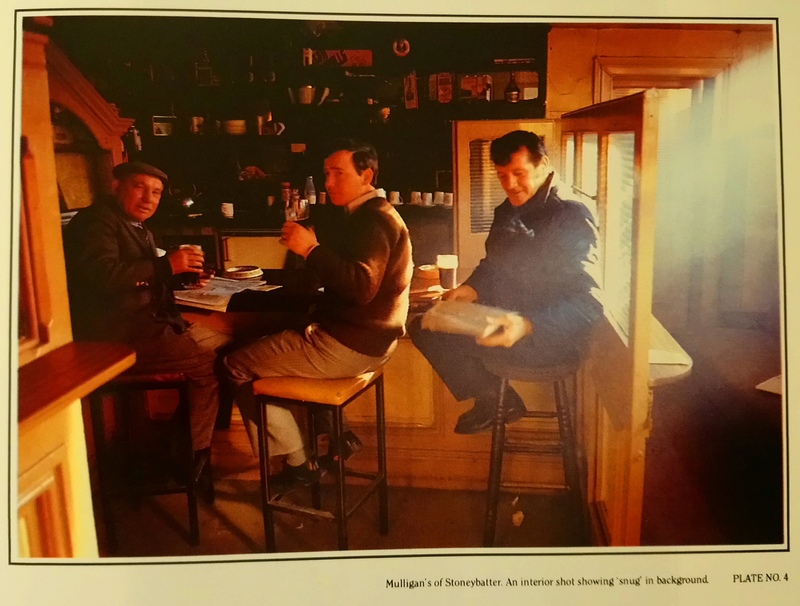 It features 60 full-colour photographs of pubs across Ireland taken by Liam Blake with accompanying text by David Pritchard and Joe Reynolds. It was first published in 1985 with this softback edition republished in 1993. 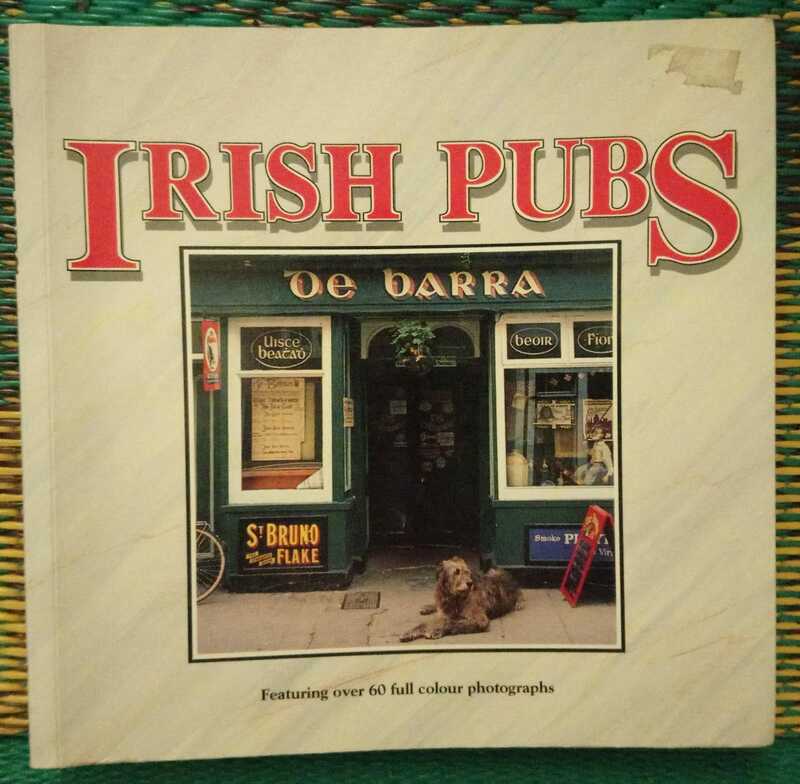 I’ve included the 15 photographs of Dublin pubs which I am guessing were taken in the 1984-85 period. The Brazen Head, 20 Lower Bridge Street, Merchant’s Quay. We visited this pub in our November 2009 pub crawl. 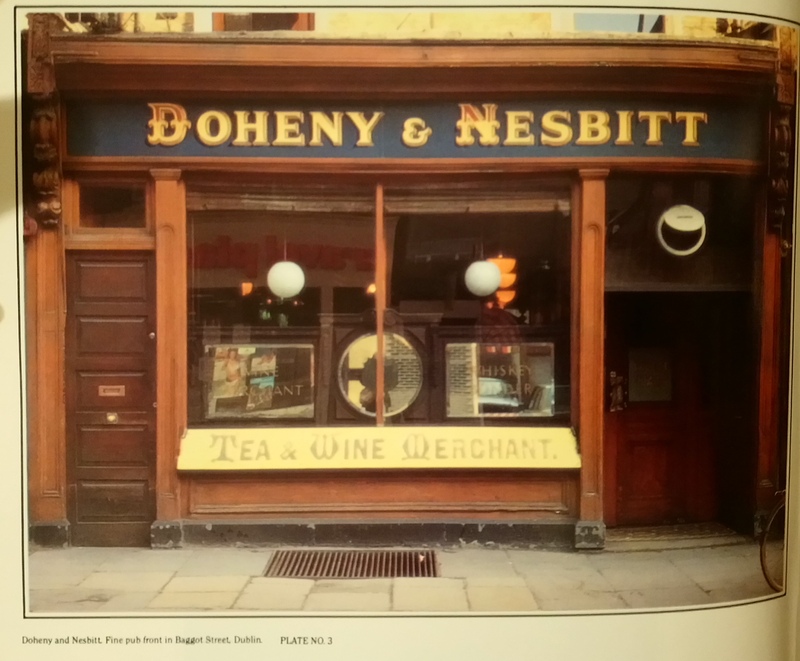 Doheny & Nesbitt’s at 5 Lower Baggot Street near St. Stephen’s Green. A pub we also visited in our November 2009 pub crawl. Mulligan’s (now L. Mulligan Grocer) at 18 Stoneybatter, Dublin 7. A boozer we reviewed in our May 2012 pub crawl. 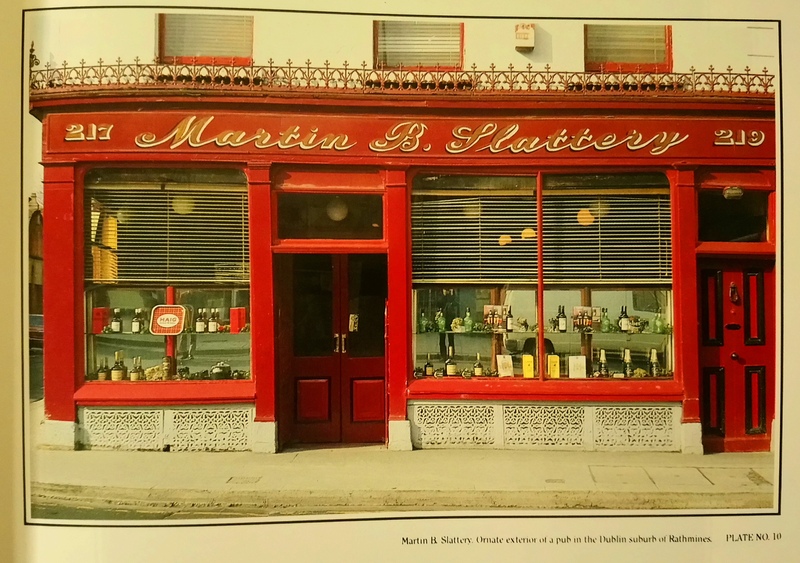 The exterior of Slattery’s, 217 Rathmines Road in Rathmines. A pub we dropped into in our February 2010 pub crawl. 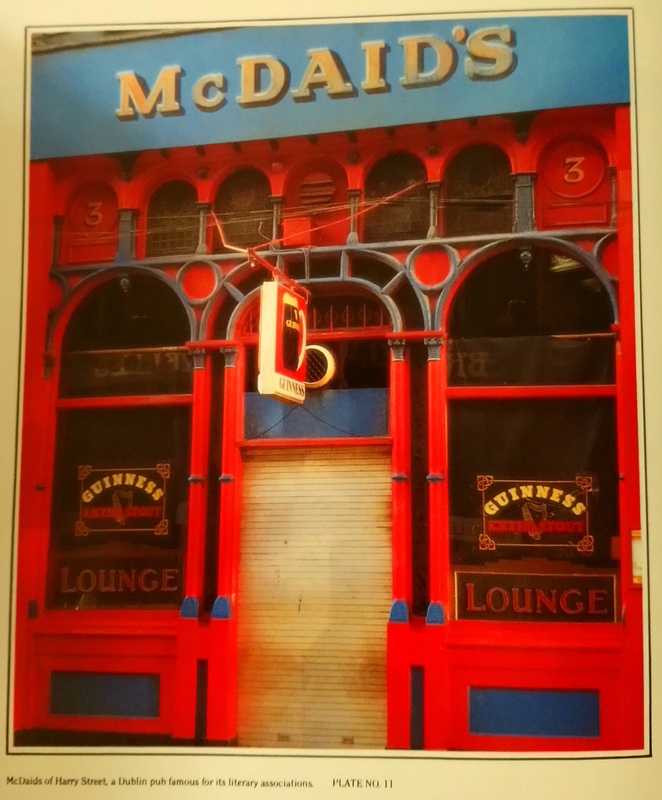 McDaid’s pub at 3 Harry Street off Grafton Street. Somewhere we visited in June 2010 for a pub crawl.